The students at American Heritage of South Jordan have not had an on-site gymnasium since 2008, when the school was located at its former campus. American Heritage of South Jordan is planning to build a new gymnasium with a stage. The gymnasium project will cost $1,750,000. American Heritage of South Jordan has secured a matching donation of up to one million dollars! The school administration, faculty, and students are so grateful for this generous donation. The school needs to raise an additional $750,000, which the donation will match dollar for dollar. Once the $750,000 is raised by the school ($1,500,000 including the dollar for dollar match), the additional $250,000 will be generously donated to American Heritage of South Jordan. We need assistance from the community, and our friends, in order to make this gymnasium a reality. We hope you will help us through a generous donation at one of the levels described below, or an introduction to others who might be willing to assist in our cause. Send your gift to the address below or click on the button to donate online. 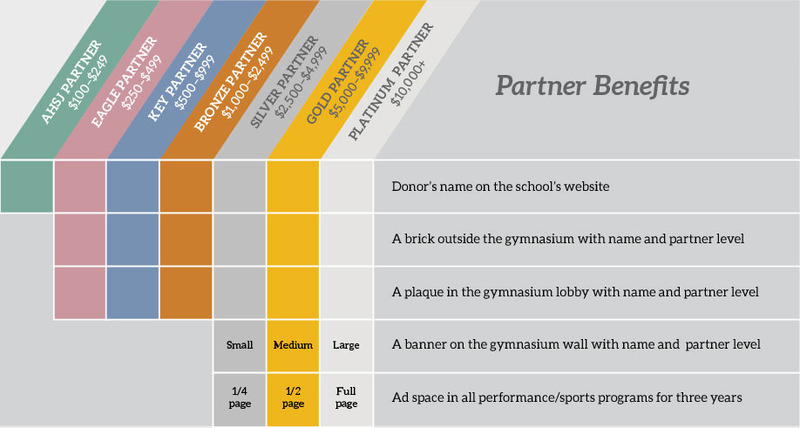 Become a partner with us and you will receive the following benefits for various levels of giving. Contributions under $100 are gladly accepted but will not have any recognition benefits associated with them. For more information, contact Elsha Yorgason, School Director, at (801) 254.3882.